Romain holds a MSc in Electrical and Electronic Engineering from Imperial College London. Having started his career as researcher on speech recognition algorithm, he then moved into managing high technology projects in a variety of sectors (consumer goods, banking, ICT). In an unexpected manner (ask him, he will tell you 😉 ) he came across European Affairs and he loved it instantly. Having worked as Research Manager for the European Aircraft Manufacturers Association, he went on managing European projects addressing innovation in Air Transport. 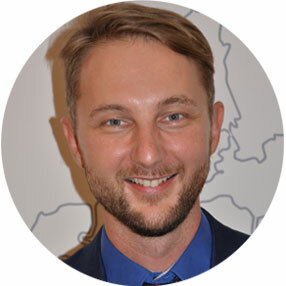 With this experience he joined the European Institute for Innovation and Technology (EIT) as Project Officer to look after the Knowledge and Innovation Community EIT Digital. Directly prior to joining CERN, Romain was the Chief Project Officer of the European Business Aviation Association, programme managing a portfolio of projects in this very innovative transport sector. Romain joined CERN in November 2017 and is working at the EU Office to support existing and identify new EU project opportunities. Romain enjoys dancing and discovering cultures throughout the world.